Day or night, plumbing issues occur when we least expect it. Typically, plumbing problems arise at the worst times, too. At Emergency Plumbing & Solar, we aim to resolve your plumbing issues fast, and we always focus on quality above quantity. When you work with us, you’re treated like our only client. No matter the problem, we’re there for you. Within your business, a single dangerous situation could lead to an eventual downfall. No customer wants to put themselves at risk or to be uncomfortable when your plumbing system doesn’t function properly. At EPS, your business is our business. Give us a call, and we’ll repair or install new systems for your company! Typically, you should only allow water, plumbing-safe products (such as toilet paper) and minimal food residue from dinner down the drain. Anything else should be tossed in the trash. When a clog occurs, let our technicians remove the problem once and for all! If your water heater is making noise or does not provide hot water, it’s time for repairs. Do not hesitate to give us a call. We know that a broken water heater can lead to severe plumbing issues, and even structural damage. Let us tackle the problem promptly. Picture this: It’s the middle of the night and a pipe in your basement bursts. Who do you call? Who is even open at this time? Know that you can call Emergency Plumbing & Solar at any time for emergency plumbing repairs! 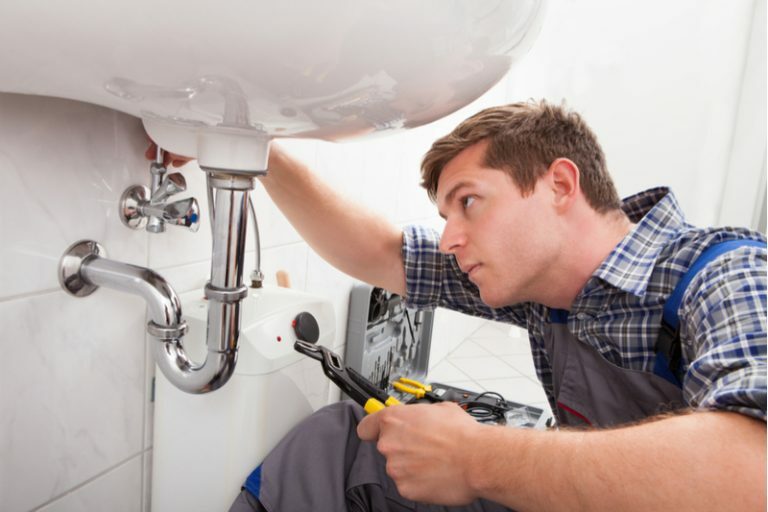 Looking for a plumbing company you can rely on? You’ve come to the right website! Emergency Plumbing & Solar is a family-owned and operated company that has served Kapolei and the rest of Oahu Island for 16+ years. We are known for providing prompt service at affordable prices, and we get the job done right. Our Kapolei plumbers are well trained in water heater installation, drain cleaning, sewer line repair, and many other residential plumbing services. As an A+ rated business by the Better Business Bureau, you know you can depend on us to provide high quality service for every job, big or small. Remember, we’re available 24/7, so call us the moment you need us. Slow drains? Larger water bills? Sewer backups? If you notice any of these issues, call the team at Emergency Plumbing & Solar today. We’ll perform a sewer video camera inspection to quickly assess any problems in your sewer lines – like damage from tree roots or large clogs – without having to dig into your property. By inserting the video line, we can determine the condition of your sewer pipes and whether or not they need immediate care. If we find a problem, we can clear your sewer line and prevent the possibility of future backups. Best of all, this preventive measure is quick and affordable. Call us today to set up an appointment. A backed up toilet at your home or business is no joke. It could cause thousands of dollars of damage in no time. Luckily, the highly-trained experts at Emergency Plumbing & Solar are on the job 24/7 to tackle plumbing problems like clogged drains, broken pipes, and cracked sewer pipes ASAP. We have helped countless Kapolei families and businesses for the past 16+ years – and we’re ready and waiting to help you in your time of need! Kapolei is a planned community, and it shows. The residential growth we’ve experienced here is unfounded elsewhere. The area is known for growing sugarcane and pineapple – staples of Hawaii! To schedule plumbing service in Kapolei, HI, contact Emergency Plumbing & Solar at 808-691-9309. We’ll handle any plumbing issue you have! We serve entire Kapolei, HI 96706, 96707, 96709. Kapolei Overall rating: 5 out of 5 based on 10 reviews.